is a Shareholder in the firm, the Chairperson of the firm’s Litigation and Employment Law Departments, and serves on the firm’s Board of Directors. Greg has been successfully litigating a variety of business and tort cases across New Jersey, Pennsylvania and Ohio since 1989. In April 2008, Greg (and his wife, Heather, an attorney and Registered Nurse) moved from Cleveland to Columbus to provide LNL with more top lawyers focused on trial practice in both state and federal court. Greg’s prior experience includes a number of years of trying cases as a defense lawyer, having worked for several prestigious litigation firms (Philadelphia; Cleveland) on behalf of national insurance companies and Fortune 500 companies. Greg has built a reputation by winning cases that other firms are reluctant to take to trial, and has eight and nine-figure jury verdicts to his credit. Greg has thus represented both plaintiffs and defendants in complex tort and commercial litigation, contract disputes, employment matters, civil rights and discrimination/harassment cases, intellectual property cases, and transportation and logistics cases, at both the trial and appellate levels. In addition, Greg has co-counseled several major class action cases including franchise and securities litigation. Active in his community and Church, Greg is also the father of five and, in his “free” time enjoys fishing, golf and playing guitar for his daughter, Logan. – Successfully settled a group of lawsuits against Petland, including a putative class action that accused the national pet store franchisor chain of selling sick puppies from puppy mills instead of using reputable breeders (2010). 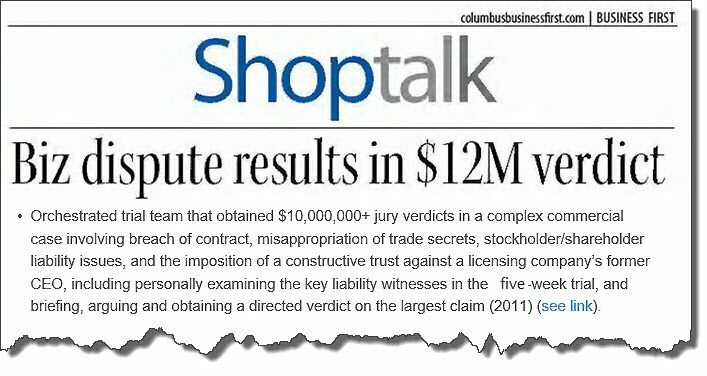 – Successfully defended a global leader in loss prevention and risk management against eight-figure claims of trade secret misappropriation and related business torts in the United States District Court for the Northern District of California (2010). – Established, staffed, and managed the Cleveland law office of a Philadelphia-based product liability, mass/toxic tort litigation firm. – Acted as lead defense counsel for a Fortune 500 company, various manufacturers, and a defense group defending toxic tort and complex product liability claims both nationally and locally, supervising and directing outside counsel in the process.